Cheapflights UK, the UK's leading website in price search and comparison, is indulging chocolate lovers this Valentine's by combining their love for sugar with a love for travel in destinations to melt every heart's desire. 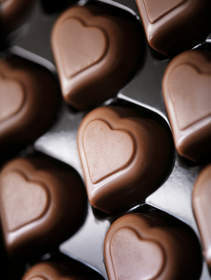 "Chocolate and flowers are a long standing tradition when it comes to romance, so teaming them with travel to destinations featuring all manner of things chocolate including chocolate museums should prove a sweet package for your sweetheart this Valentine's," says Nadine Hallak, Travel Expert for Cheapflights UK. With chocolate sales on the rise around the world, it's no surprise that Belgium is ringing in at number one in search for this time of year. Producing 172,000 tons of chocolate per year,*** it is counted as one of Europe's top two chocolate destinations and houses chocolate museums, factories, and festivals. To witness the sweet stuff in all its glory, visit the Museum of Cocoa and Chocolate complete with glass cases housing the moulds of chocolates past. If you're in the mood for something exotic, Guatemala is the place to go. It might seem a bit random for a choco-holiday, but historically Mayans used chocolate as a trading currency, and considered it as valuable as gold. Today, it is still treated as such making it very high in quality with their chilli infused hot chocolate officially recognised as some of the best in the world. So grab yourself a cuppa and go visit the Guatemala National Museum for a glimpse of the famous Chocolate Vase. Lebanon serves as another unexpected choco-destination and as it's mostly noted for sweets like Baklava, but the country also offers up famous chocolatiers like Patchi, whose shop in downtown Beirut is practically a museum in itself. The chocolate is top quality, but you may not want to unwrap it as the packaging is literally an art form. Each individual chocolate is specially wrapped into whichever shape, size or occasion the customer requires -- when it comes to design, the sky is the limit here. The last chocolate stop is Africa, possibly the most unlikely destination of all for chocoholics, but it shouldn't be. According to reports, the continent produces 70 percent of the world's chocolate with Ghana in particular serving as the perfect destination to represent Africa's love of chocolate. While it may not offer choco-museums, it has plenty of other attractions in the way of beautiful beaches and pristine wildlife for lovers to enjoy as they munch on interesting chocolate flavours such as lemon, ground nut, and coffee flavour. To start planning your chocolate themed Valentine's break now, search and compare flights to any of these destinations by visiting Cheapflights UK. Cheapflights.co.uk is the best place to find cheap flight deals and up-to-date travel information. It is part of Cheapflights Ltd., a leading international travel price search and comparison dotcom launched in the UK in 1996. Cheapflights does not sell travel products; it publishes one of the largest selections of airfare deals available online. These are advertised by a huge range of flight providers from each of its national sites' home countries. Every day, travellers can search for flight deals from both traditional and low-cost airlines, as well as smaller specialty-travel providers. Our experienced travel experts also post handpicked deals and flight offers exclusive to Cheapflights. The travel guides and travel tips sections are packed with more than 500 destinations and the latest news and information to help travellers enjoy the best possible experience every time they fly. Sign up for the Cheapflights.co.uk Newsletter which contains deals customized to travellers' specific preferences or follow us on Twitter for hot travel deals and helpful tips.